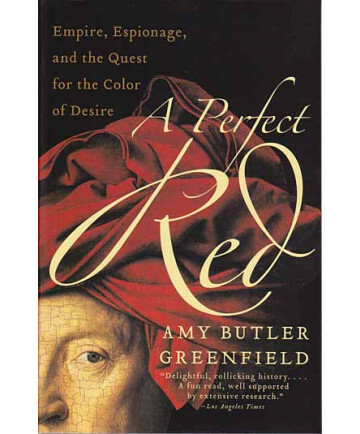 A Perfect Red: Empire, Espionage, and the Quest for the Color of Desire by Amy Butler Greenfield "In the sixteenth century, one of the world's most precious commodities was cochineal, a legendary red dye treasured by the ancient Mexicans and sold in the great Aztec marketplaces, where it attracted the attention of the Spanish conquistadors. Shipped to Europe, the dye created a sensation, producing the brightest, strongest red the world had ever seen. Soon Spain's cochineal monopoly was worth a fortune. As the English, French, Dutch, and other Europeans joined the chase for cochineal- a chase that lasted for more than three centuries- a tale of pirates, exploreres, alchemists, scientists, and spies unfolds. 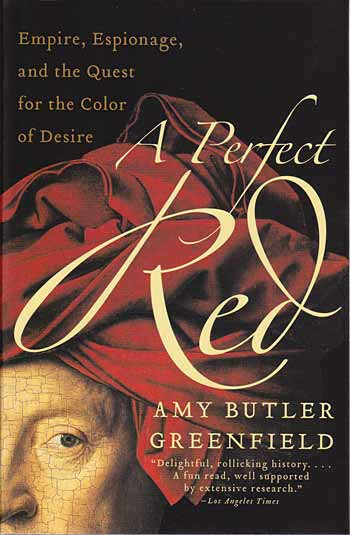 A Perfect Red evokes with style and verve this history of a grand obsession, of intrigue, empire, and adventure in pursuit of the most desirable color on earth." Soft cover, 338 pages.